I spent the long Memorial Day weekend in North Carolina. It was hot and humid. Plans for hiking to search out subjects to photograph for my macro photography workshops dripped off with my makeup. On the positive side, the weather drove me to explore indoor events like visiting the North Carolina Museum of Art in Raleigh. Have you ever had a perfect day? Well, I had one at NCMA. A month ago, I was told by a Los Angeles curator to look up Todd Hido’s work because of similar sensibilities in our photography. Coincidentally, Hido’s photos were on display in a photo exhibit titled Presence/Absence. The 23 photos by various photographers imply the presence of people, even though none are visible. We can read the absence of people as a sort of loneliness and the results humanity has on history – whether it be personal or universal. My favorite image is by Rob Amberg. Titled A Field Of Cut Burley Tobacco, pictured above, (Gelatin-Silver print, 1993, printed in 2002). This image is loaded with metaphor about the effects of man’s history in the United States. 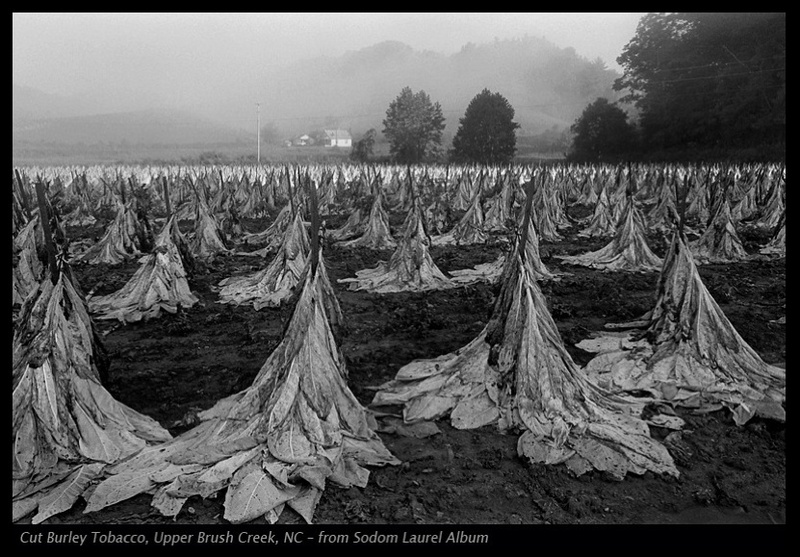 Amberg uses a long depth of field to tell the story of tobacco harvesting in North Carolina. But this image takes us farther back into the history of the US. The photo depicts hundreds of stacked tobacco leaves, making strong shapes of Indian teepees (tipi) from the foreground to deep perspective in the mid-ground. The teepee shapes remind us that the land was once harvested by American Indians and their presence has been replaced by European settlers. The background shows a modern house with two trucks against a backdrop of empty hills. Another reminder of the progress of civilization; the contemporary home replaces the teepee as a human dwelling space. The separation of past and present is driven home by a streak of ambient light that slices the photo in half just at the edge of the last tobacco plants and the beginning of the farm. Another compelling image is by David Simonton. Corridor, Ellis Island, Oct 1988, (Gelatin-Silver print, printed in 2004). 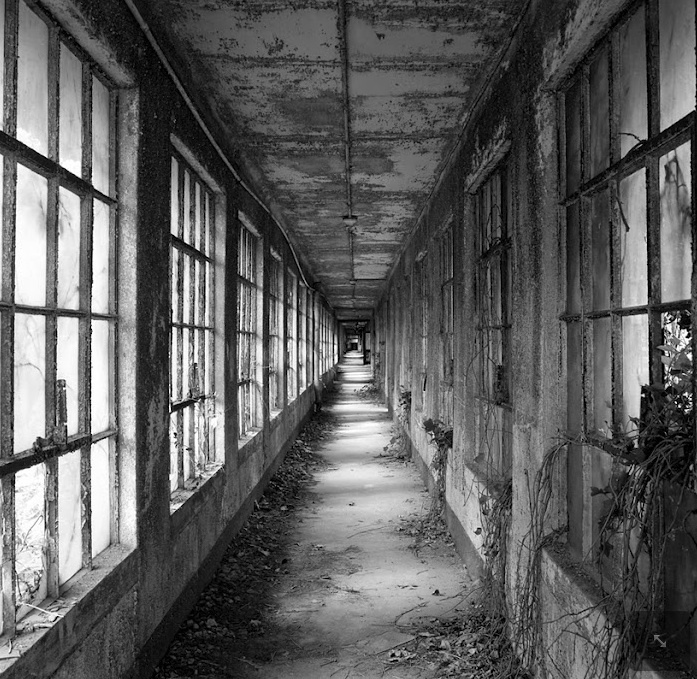 An abandon hallway dares us to enter the worn and disheveled space. The plants and trees have broken through the windows reclaiming what was once their domain. Presence/Absence included images that were somewhat whimsical. A child’s type of fun is implied by Jeff Whetstone’s Jumping Tree, Haw River. 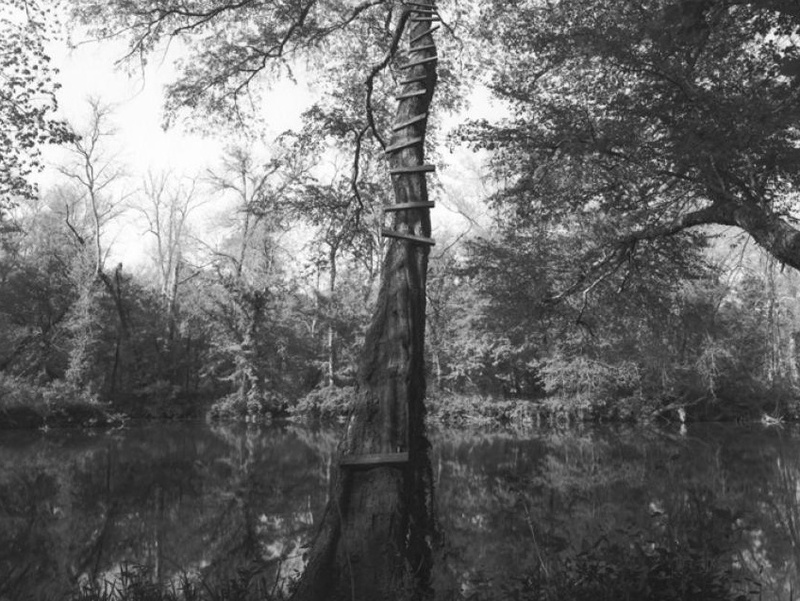 Strips of wood are nailed to a tree forming a step-ladder to climb and jump into the river. Other images portray the manufactured spaces and the accidents humans leave behind. 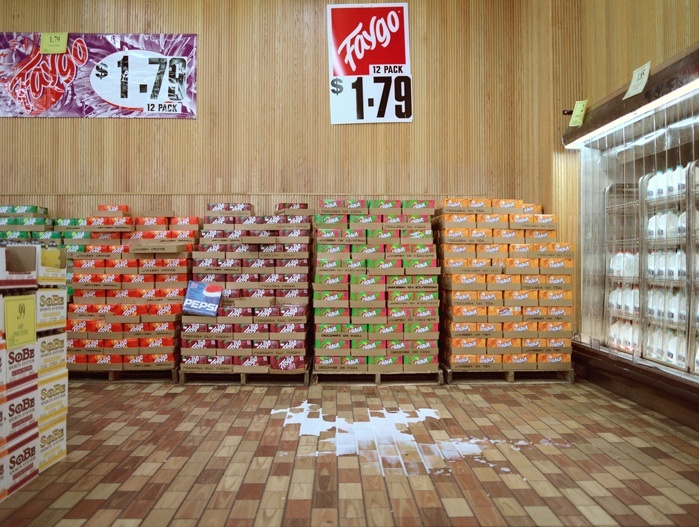 Brian Ulrich’s Kenosha, Wisconsin – Spilled Milk shows an impersonal big box supermarket with its harsh fluorescent lighting warning you not to slip on the puddle of spilled milk on the fake wood floor. Once I absorbed this well thought out exhibit, I walked over to the West Building to see permanent collection. Motherwells, Klines, Frankenthalers, and more of the big names of modern art welcomed me into the many galleries. The antiquities collection, Renaissance, and Flemish paintings were impressive as well. After 3 hours, my feet were tired so I limped over to Iris, NCMA’s beautifully designed restaurant. Let me say this – even if I hated the art on exhibit, I would still go back to have dinner at Iris. The wine and food were excellent, and the free live jazz added the final touch to a perfect day. One last piece of information. 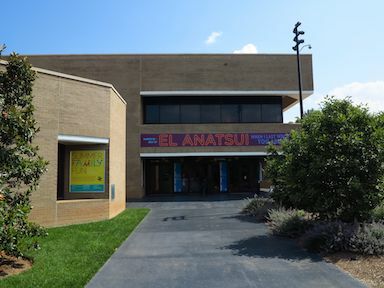 Entrance to NCMA is free. Parking is free. They have free live music on Friday nights. You can’t get a better bargain for a day full of wonderful art, music, and food. Check out the calendar for more info on films, concerts, and dance. Posted in Art Galleries, Digital Photography, documentary photography, Exhibits, Fine Art, fine art photography, landscape photography, Museums, nature photography, Photography, Teachers, Workshops & Lessons and tagged Art, Contemporary art, Ellis Island, exhibits, Haw River, Memorial Day, museum exhibits, museums, NCMA, North Carolina, North Carolina Museum of Art, Photography. Bookmark the permalink.